Archaeologists usually work on dry land and sometimes work under water, but it is rare for them to explore a wet site that is on land. 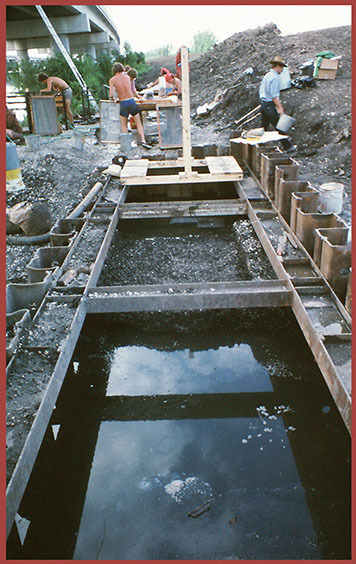 This was the case at the Bayou Jasmine site in southeast Louisiana. Indians lived there for thousands of years, when the ground was high. Later, the land gradually sank, so the lower levels of the site were below water. The wet conditions led to preservation of artifacts that normally would have been lost to decay. However, the water made the site very hard to excavate. Archaeologists used special techniques to learn about life at Bayou Jasmine. (Left) Archaeologists had to find a way to dig at the site even though it was mostly under water. Water pumps and a cofferdam were needed. Credit: LSU Museum of Natural Science. (Below) Archaeologists found lots of artifacts at the Bayou Jasmine site that do not normally preserve well, like the bone fishhooks seen here. Credit: R. Christopher Goodwin and Associates. Be sure to click and scroll over pictures to learn more and get a better view! © 2015 Louisiana Division of Archaeology - click here to return to Discover Archaeology's Interactive Exhibits.